Wanting to reach kids who would not otherwise have a chance to play football, Grace Church, Osceola, Ind. (Greg Serafino, pastor), has begun a team. They recently had their first game of the season and a local television station reported on the event. A portion of the story appears below. Click here to see (and read) the complete report from ABC 57 News. Osceola Grace Eagles coach Ty Biller, right, is interviewed about the club football program. ROCHESTER, Ind. – It’s a true underdog story. 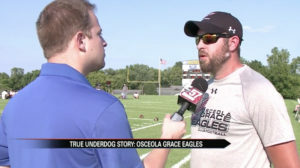 The Osceola Grace Eagles are matching up against high school football teams all across Indiana this season, and they’re doing it with players that have never put on the pads, until now. The Eagles won their first game of the season last week, beating Indianapolis Howe 62-12. “Our school didn’t have football or any other sports so I thought trying football would be fun and hard,” said Santiago Wilkinson, a linebacker for the Eagles. The Eagles are mostly made up of players across schools from Michiana like South Bend Riley and Elkhart Memorial. Click here to see (and read) the complete report from ABC 57 News.